Deciding on a decent reel that suits your fishing style is the next hurdle we will try to get over. If you are new to the sport you have to ask yourself a few questions that you might not even be able to answer. A lot of people will ask a very generic question such as "what is the best reel for snapper" or to broad such as "what is a good reel I can use on the beach and rocks for catching whiting, bream, tailor, salmon, jew and sharks". Instead try and think about what you really want to catch and where you are likely to fish. What fish species and size are you targeting? Bait, soft plastics or lures? Boat, trolling, rocks, surf or shore? The more focused you can answer the easier it is to work out a reel that will suit you best. What we are trying to do is reduce a few million potential variables down to a couple of hundred. From there a few good suggestions should be forthcoming and personal preference should have you selecting a reel that you like and will do the job you want it to do at a price you can afford. 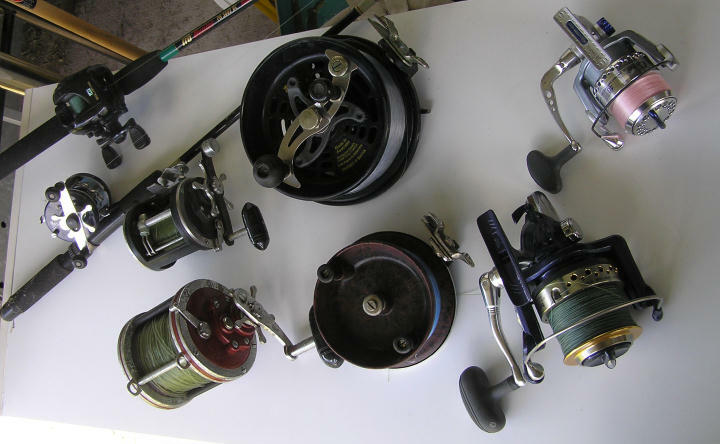 The 3 main style of reel are conventional/overheads, threadline/spinning and centrepin/Alvey. Like individual models of reels each has its strengths and weaknesses. Overhead reels can offer huge line capacities, power and are well suited to fishing monofilament. Spinning reels are more commonly braid friendly, easier to use and simpler to cast. Alveys offer unparalleled longevity, feel and maintenance free fishing. Fishing for bream in a creek, of flathead in a bay requires much less line than than casting for big tuna or dropping jigs to xos kings, amberjack or sampson. I guess for children and smaller individuals lighter weight reels make sense but if you are throwing lures all day the difference a lighter reel can make on endurance is very noticeable. Also rods are usually best balanced with a lighter or heavier reel to suit making fishing the combo much more enjoyable. Weight can also reflect quality however once again this is not always true. Materials used in reels can include plastic, composites, aluminum, stainless steel, brass, titanium etc etc. Sometimes this doesn't matter depending on quality, where the material is used and for what purpose and size of the reel and potential use. When you put together a fishing outfit there is usually a sweet point where the rod, reel, line and tackle are in harmony and work perfectly together. The drag should be the weak point and smoothly release line when pressure that could otherwise break gear or line is applied. With that in mind the drag needs to work faultlessly in the likely range. As mentioned earlier a reel whose price wont leave you totally gutted or have your partner filing for divorce if you destroy it first trip out is a good choice if it is up to the job. However sometimes a man or a woman just has to have a new toy. If you need to stretch the budget for a must have item then go for it and enjoy. Fishing should be about enjoying the experience first and foremost, so select your fishing reel with the combination of heart and mind that makes it all come together best for you.